“No ifs,” came Daoist Heavenspan’s cold voice from within the black light, as he shot directly toward the Saint-Emperor! In the final moment, just before Daoist Heavenspan was about to hit him, the Saint-Emperor’s eyes flashed with madness. The truth was that he could have held back and not come to fight, and in fact, the moment he had opened his eyes earlier, he had known that he was not a match for Daoist Heavenspan. But this was his home, and he was the Saint-Emperor, whose Dao came from the Eternal Mother. And an even more important factor in his decision… was Bai Xiaochun! Bai Xiaochun had chosen a different path from him, something that he didn’t understand early on. However, now he was enlightened. Having received the approval of the Eternal Mother, he knew that Bai Xiaochun was choosing… a path of incomprehensible difficulty! His Dao had nothing to do with anyone else! His Dao was his own, and thus, if he achieved it, would exist on a different level, similar to the Mortal Renegade’s!! The Saint-Emperor knew he couldn't defeat Daoist Heavenspan, and yet, came to fight anyway. He would rather self-detonate, killing himself in body and soul, if the result was causing even a slight delay for Daoist Heavenspan. However, before the Saint-Emperor could do anything else, and even as the black beam of light that was Daoist Heavenspan was about to hit him… a beam of Archaean Luminescence suddenly shot through the air! Then came a second, a third, and a fourth…. In the blink of an eye, 300 beams of Archaean Luminescence were shooting toward Daoist Heavenspan, all of them bursting with archaean levels of power. Although one such beam might not be very frightening to Daoist Heavenspan, the power of so many of them combined instantly stopped him in his tracks. Even more importantly, whether it was the Saint-Emperor or Daoist Heavenspan, and in fact, to all cultivators of the Eternal Immortal Domains, Archaean Luminescence represented one thing! “Bai Xiaochun!” the Saint-Emperor breathed, looking up into the sky. “Bai Xiaochun! !” A very serious expression appeared on Daoist Heavenspan’s face, and he also looked up into the sky, toward a shocking burst of energy that was approaching from beyond the heavens!! They weren’t the only ones to react in such a way. In Arch-Emperor City, Song Junwan, Hou Xiaomei, Zhou Zimo and Gongsun Wan’er all looked up with wide, disbelieving eyes. Meanwhile, Xiaoxiao, Dabao and Xiaoxiao looked over at Bai Xiaochun’s secluded meditation facilities, as did the Grand Heavenmaster and other powerful experts. All of them were unsure of what was happening. However, considering that so many of them recognized Bai Xiaochun’s Archaean Luminescence, they all began to get excited. As the cheering rose up, Daoist Heavenspan frowned. After all, the incoming energy was incredibly powerful, but at the same time, didn’t seem to be what he remembered Bai Xiaochun’s energy feeling like. The Saint-Emperor could also sense that something strange was going on. That was when they both caught sight of an enormous fan moving toward the Eternal Immortal Domains at top speed, causing rumbling sounds to fill the air! It was none other than Bai Xiaochun’s treasured fan! Visible in the fan face, within the tower that housed the Essence left behind by the Worldly Daoist, was Song Que’s corpse, sitting there cross-legged! His face was pale, and he looked dead. However, in addition to the aura of death that radiated out from him, there was also a powerful life force!! Furthermore, the Dao Essence of Life and Death which had once permeated the tower was gone, and existed instead inside of Song Que!! A sigil could be seen on his forehead, which was none other than the face of the Worldly Daoist!! Close examination would reveal that it resembled Song Que’s face to a large degree, the reason being that the Worldly Daoist had already perished, and Song Que had absorbed his Dao. Although he now possessed the Worldly Daoist’s mark, it was his own, and he could control it! As the fan neared, Daoist Heavenspan’s eyes narrowed, and the crowds cheered. And that was when Song Que’s eyes opened! One of them was black, the other was white, and neither had pupils! At the same time, the sigil on his forehead radiated glittering light, and he erupted with a sovereign aura. He rose to his feet, two tempests raging around him as he stepped forward off of the fan! He vanished, reappearing in the Eternal Immortal Domains… right in front of Daoist Heavenspan! “You shall not pass!” he said, his voice grim. The sight of his black and white eyes caused Daoist Heavenspan’s pupils to constrict. As for the Saint-Emperor, he didn’t recognize Song Que, and yet, could hear Song Junwan crying out from within Arch-Emperor City. Song Que heard her call, and looked down at her, a smile playing out on his grim face. In that moment, Daoist Heavenspan turned into a black blur that shot directly toward him! “The Dao of nirvanic extermination?” Song Que said. “I see the calmness of nirvana here, but no extermination!” With that, he waved his hand, causing a black light to spring up that deeply resembled the black light being used by Daoist Heavenspan. Then, without any hesitation, he began to fight. A boom rang out as Daoist Heavenspan’s form of black light shuddered for the first time, and he appeared in bodily form, staggering backward a few paces, staring at Song Que with a look of shock in his eyes. Eyes flashing, Song Que said, “The Essence of life and death was prepared by the Worldly Daoist, both to resurrect the object of his love, and also to resist the Mortal Renegade! “I'm not sure whether it’s strong enough to fight the Mortal Renegade, but… it’s more than strong enough to fight you!” With that, he blurred into motion as he shot toward Daoist Heavenspan. Expression brightening, the Saint-Emperor flew forward and joined forces with Song Que. Two half-sovereigns were now a flurry of attacks, crushing Daoist Heavenspan over and over again. In only a few breaths worth of time, a string of massive booms rang out to shake heaven and earth. Then, the three of them began to rise higher and higher into the air, until they were in the starry sky outside of the Eternal Immortal Domains, where they continued to fight. Daoist Heavenspan was the strongest of them all. However, he was having trouble dealing with Song Que’s Essence magic, and was sustaining injuries. If he had been fighting with Song Que alone, then it might not have been a big problem, but he also had the Saint-Emperor to deal with. He was fighting two half-sovereigns, one of whom was using tactics specifically designed to fight against him. It was impossible for him to regain the upper hand. After all, when half-sovereigns fought, even the slightest slip-up could lead to drastic consequences. Blood sprayed out of Daoist Heavenspan’s mouth as he fell back over and over again. 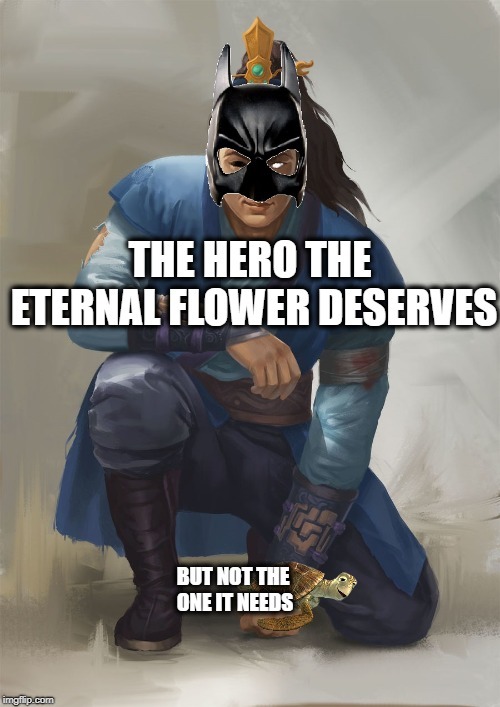 Sometimes, he managed to dodge out of the way of Song Que’s Dao Essence of Life and Death, only to slam into the divine abilities of the Eternal Flower, wielded by the Saint-Emperor. Daoist Heavenspan coughed up a mouthful of blood, and prepared to flee, only to see Song Que wave his hand, and summon the fan, which shot toward him and shrank down for him to grab it! Because Song Que possessed the Dao Essence of Life and Death, he could use the most orthodox legacy techniques of the Worldly Daoist. Even the spirit automaton Bai Xiaochi would follow his orders, which was something that Bai Xiaochun could never have imagined would happen. Unless Bai Xiaochun specifically interfered and prohibited it, Bai Xiaochi would do anything that Song Que asked him to do. The shrunken fan appeared in front of Song Que, who grabbed it and waved it out in front of him. Instantly, a huge river swept forth, filling the starry sky so quickly that Daoist Heavenspan was overwhelmed, and found it impossible to escape. Next, a lonely boat appeared, shining with Archaean Luminescence. The two archaean slaves on the boat immediately leaped forth to attack, and yet, things weren’t over yet. Much to the consternation of Daoist Heavenspan… the Daoist Pagoda of Life and Death appeared in the starry sky, along with the mountain that housed it. They were joined by… an enormous sovereign’s arm!! This was the true might of this magical item! The river that flowed through the starry sky seemed to contain sealing power that perfectly conformed to Song Que’s Dao Essence of Life and Death. Although it was not at the level that the Worldly Daoist could have utilized, it was close. And no matter how Daoist Heavenspan screamed and fought, he couldn’t escape. And that was when the mountain and the sovereign’s arm began to crush down toward him! !